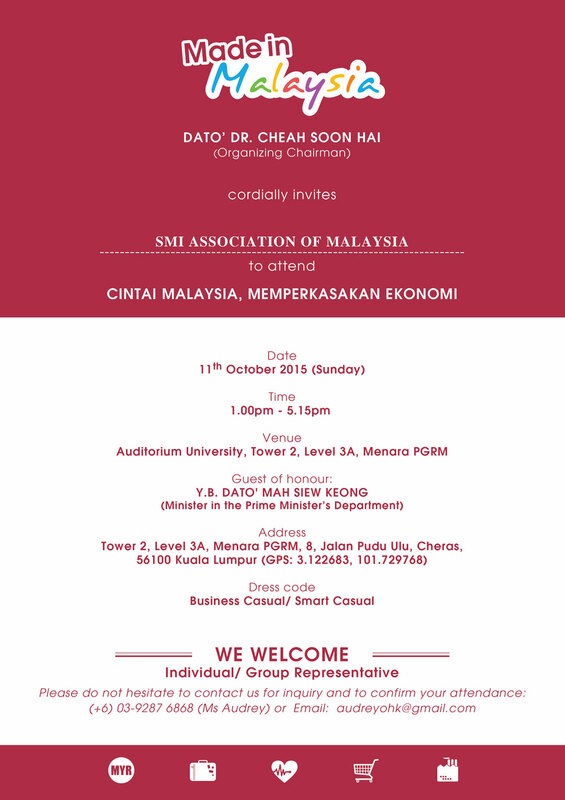 Please be informed that Social Economic Development Task Force, Parti Gerakan Rakyat Malaysia would like to invite you to participate in the “Cintai Malaysia, Memperkasakan Ekonomi” on 11th October 2015 (Sunday). This event will be officiated by Y.B. Dato' Mah Siew Keong, Minister in the Prime Minister's Department. The Oval Debate dedicated toward "The Malaysian Ringgit - Navigating Turbulent Times" aims to discuss solutions in assisting Malaysians in overcoming the current economic challenges today. The topic will mainly discuss on the information sharing and concrete actions to mitigate the following economic challenges; how to encourage local spending, increase our ringgit power and, control and manage the cost of living. This Oval Debate will also consider SME strategies to increase sales and best practices in business spending. Seats are limited, kindly R.S.V.P by 8th October, 2015 (Thursday) and email to [email protected].